Drew Angerer/Getty ImagesAdult film actress Stormy Daniels. President Donald Trump’s attorneys scored a victory in court when a federal judge dismissed adult film actress Stormy Daniels’ defamation lawsuit against Trump. Daniels was also ordered to pay Trump’s legal fees. Daniels said the man warned her not to publicize her purported sexual affair with Trump. 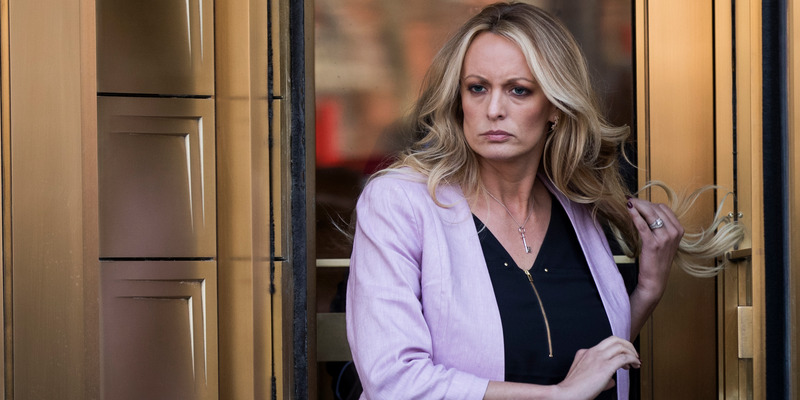 President Donald Trump’s attorneys scored a victory in court when a federal judge dismissed adult film actress Stormy Daniels’ defamation lawsuit against Trump on First Amendment grounds and ordered her to pay Trump’s legal fees. “No amount of spin or commentary by Stormy Daniels or her lawyer, [Michael] Avenatti, can truthfully characterise today’s ruling in any way other than total victory for President Trump and total defeat for Stormy Daniels,” Charles Harder, an attorney for Trump, said in a statement to Business Insider. “Mr. Trump used his national and international audience of millions of people to make a false factual statement to denigrate and attack Ms. Clifford,” the federal court complaint said at the time. Harder argued that Trump’s statement ought to be considered protected speech and that Daniels did not identify specific damages.